The record setting 200 free relay team left to right: Meghan Posey, Kaitlyn Riegle, Morgan Fernandez, and Haley Geiger. 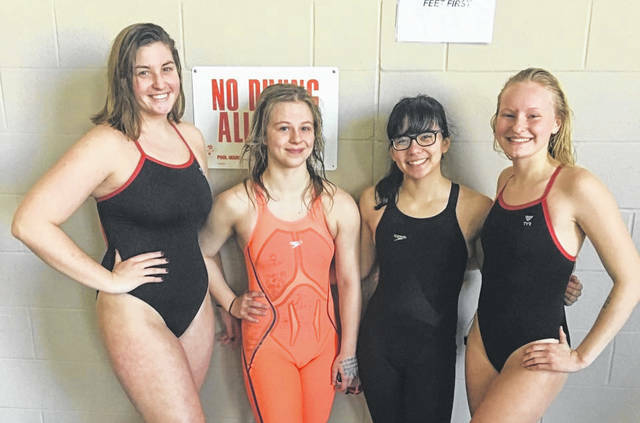 TROTWOOD — During the sectional meet Saturday at Trotwood-Madison High School the Wayne Warriors Girls Swim Team of Kaitlyn Riegle, Haley Geiger, Meghan Posey, and Morgan Fernandez qualified for the Southwest District Division I Championship meet for the first time since 1998. “The Southwest District is quick! It is full of your top elite swimmers in the state of Ohio. We talked all week about trusting their training and their shot at qualifying this year. They knew they knew what they needed to do,” said Coach Lauren Lennartz. The swimmers did just that. The relay team dropped two seconds from their season best to set the new school record in the 200 free relay with a 1:50.79, earning them the 22nd seed going into the district meet. This record was previously set in 1998 with a 1:50.93 and was the last Wayne swim team to qualify for districts. The same relay team of Riegle, Geiger, Posey, and Fernandez also set a new school record in the 200 Medley relay with a finishing time of 2:04.63. Morgan Fernandez had an outstanding swim in the 100 butterfly. She finished third with a 1:03.91, breaking her own school record for the third time this season. “It’s amazing to see how far these girls have come this season. Qualifying to compete at Districts is tough. Our girls have proved that they can be competitive with the best swimmers in the area and I’m excited to see what they do next weekend,” said coach Lennartz. The relay team of Riegle, Geiger, Posey, and Fernandez will compete on Saturday, February 16 at Miami University. The top 16 swimmers will advance to the State meet.